Update: Google has now officially announced the roll out. Recently Google has announced a number of changes to Google Analytics. They have announced a new look interface, real time reporting, and a premium pricing model for Google Analytics aimed at servicing the needs of large sites with high traffic volumes and the abilities to analyse huge datasets. Viewing Webmaster Tools query data in Google Analytics is another change that has started to appear. The pilot was opened in June and is currently becoming more widely available. I only just saw these reports recently, but after asking around online, two SEO’s I know, Joe (Joe O’Brien SEO) and David (The Lost Agency), confirmed that these features have been appearing across a number of accounts. At this point it is not possible to build advanced segments to use with Search Engine Optimisation, but it does support a range of dimensions: Queries, Landing Pages and Geographical Summary, which also included both countries and Google Properties such as web, images, video, mobile and mobile (smartphone). At this time there are no widgets available that can be added to a dashboard either. While providing data over a longer period of time than Webmaster Tools, the search engine optimisation reports do not appear to provide as much historic data as other reports availabe in Google Analytics. However the search engine optimisation reports do support ‘compare to past’. Google’s Webmaster Tools already provide a lot of tools for segmenting and exporting data. 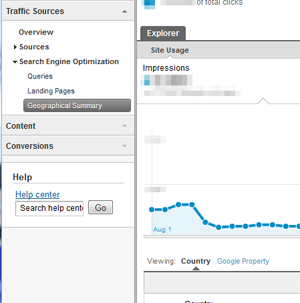 Linking a site’s Google Analytics and Webmaster Tools accounts does not add much more functionality in this regard. However there are still a few benefits that make this worthwhile. The filters available for reports in Google Analytics are far more customisable than those available in Webmaster Tools. Access to Analytics views such as Performance, Percentage and Tag Cloud will be very useful for generating reports. There is also value in the ability to use regular expressions to filter query reports for number of words, or known clusters, such as brand or product terms and their known variant spellings or alternative names and descriptions. The example above filters for search queries of between two and three words, appearing in Google’s web search with an average position better than 10 with more than 100 impressions. This was based on the Query report, and unfortunately there was no option to further filter the data by location. Google Analytics makes it possible to do things with Webmaster Tools data that was not possible without downloading and analysing the data elsewhere. The limitations on available dimensions, such as seen in the example above, do limit its ability to create a genuine representation of what is actually happening in the search engine results pages. Working with Google Webmaster Tools data in Analytics is a blunt instrument. It is great for generating reports quickly and easily, but its ability to provide deep and meaningful analysis is limited and the phrase “your mileage may vary” probably best describes it.